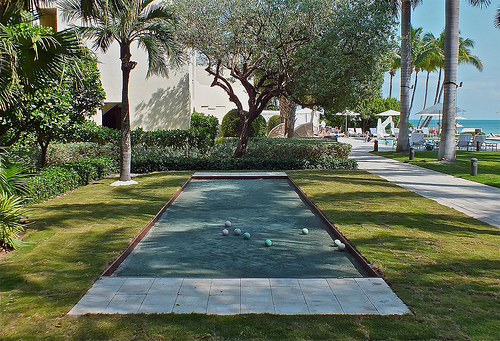 Sports Costs > How Much Does it Cost to Build a Bocce Ball Court? How Much Does it Cost to Build a Bocce Ball Court? Since all jobs will be so unique, we highly recommend HomeAdvisor.com to find licensed contractors in your area who are able to offer you an exact quote based on your ideas. According to the Bocce Builders of America, they work all over the world, and their prices, according to their official website, depends on the type of court construction and the surface chosen. The excavation, the depth of the drain field and access to the court to haul off materials can affect the costs as well. In the end, surfaces, if you were to hire them, would start at $18.50 a square foot and the total installation job, when everything is factored in, can cost $20,000 to $50,000. This ABC News article talked with a professional contractor who designs and builds bocce ball courts, and he said you should be prepared to spend $7 a square foot for a DIY job to as much as $25 per square foot when the landscaping and professional contractor fees are paid. Houzz notes the cost can be based on the complications and design, with most contractors charging more than $20,000. Courts, when constructed, will use a combination of rocks and a top coat made of either crushed oyster shells, tennis court clay, sand, crushed stone or turf, according to HGTV. All courts, regardless of the size and where it’s built, will have some sort of drainage system, a perimeter and a weed cloth installed within the coat to prevent weeds from growing in the future. Without the proper drainage and even the weed cloth, it can turn into a mucky, weedy mess in months. With most jobs, the contractor will first start with the area you’re envisioning your bocce ball court, and depending on the area, he or she will either cut away the sod or haul away debris in order to level the area. It’s essential this area is as level as possible as you don’t want the balls to randomly roll when playing the game. Once leveled, the court will be measured out and marked with spray paint, and as we mention below, a regulation court isn’t recommended due to the size. Most contractors will stick to a 10 by 60+ feet court. The court, once measured and marked, will then be framed with a material of your choice, which is usually a synthetic wood since it’s durable to the elements and works great as a stronger side material as the ball bounces off it. The best and most expensive framing option, however, is concrete. Once framed, the base rock will be installed, about three inches thick and it will then be tamped down with a compactor. The next layer, a decomposed granite will be compacted and locked into place to create a stronger surface, and the last layer, an oyster shell powder will be applied one-inch inch thick to help increase the speed of the balls when rolled. Aside from oyster shell powder, sand, stone dust, turf or tennis court clay can be used as an option as well. Once constructed, maintenance is fairly simple, only requiring a seven0inch drag broom and some standard garden tools to keep the court in tip-top shape. Experts highly advise building a regulation bocce ball court, which measures a whopping 91-by-13-feet. Since most people are limited with their backyard size in most cases, contractors will recommend a smaller court that mimics a regulation size. Typical backyard bocce ball courts will measure 10 by 60 feet. While a DIY job may sound scary, it isn’t as bad as you think. This Home Depot blog post and this DIY Network guide shows you how you can build one in your backyard, even with limited experience. If doing the job on your own, you should be able to find most of the materials locally; however, oyster shells and flour may need to be found elsewhere.